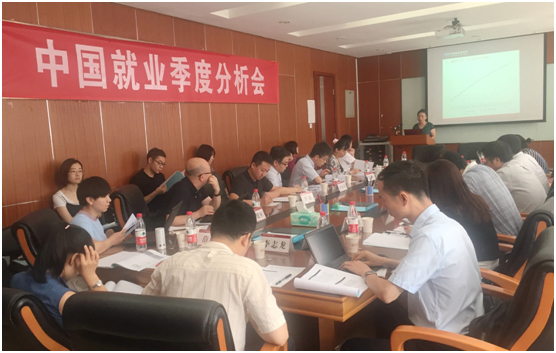 On July 14, 2017, 2017 Second Quarterly Review of Employment in China was successfully held by China Institute for Employment Research at Room 347 in Qiushi Building, Renmin University of China. Peng Yongtao, Deputy Director of Population and Employment Statistics Department, National Bureau of Statistics, Li Zhilong, Deputy Division Chief of Population and Employment Statistics Department, National Bureau of Statistics, Guo Cheng, Division Chief of Employment Promotion Department, National Ministry of Human Resources and Social Security, Li Qiang, Marketing Director of Zhilian Zhao Pin, Wu Xingyan, General manager assistant of Human Resources Development Limited Company in Suzhou Industrial Park, Zhang Xiaoguang, General Manager of Human Resources Research and Development Center in Suzhou Industrial Park, Hao Jianbin, Employment Research Director of Alibaba Group, Zhao Jing,Associate Dean of Data Research Institute of 58.com, Xue Yan, Senior Researcher of Didi Chuxing policy institution,Professor Zeng Xiangquan, Director of China Institute for Employment Research (CIER), Professor of School of Labor and Human Resources (SLHR), Renmin University of China, Associate Professor Liu Erduo , researcher of CIER, associate professor of School of Labor and Human Resources, Associate Professor Guo Yu, Chair of Social Security Department of School of Labor and Human Resources(SLHR), Geng Lin, Associate Researcher of CIER, and other researchers, Li Hongjian, Li Xiaoman etc. also participated in the meeting. The meeting was hosted by Dr. Wang Fei, Associate Researcher of CIER and faculty of Labor Economics of SLHR. For the theme report statement, CIER associate researcher Geng Lin delivered a speech entitled “The Analysis of 2017 Chinese Second Quarter Employment Situation-- based on the data from Zhilian Zhao Pin”. Influenced by the increasing demand for labor and the decline in the number of job applicants, the CIER rose to 2.26. Analyzing data from the same period, the CIER index of the second quarter of 2017 is higher than that during the same period in 2016, indicating that the employment situation is better. For industries, with continuous advance of the supply-side structural reform, the polarization of CIER has been changed. The difference between the highest and lowest CIER indices fell from 29 times in the first quarter to 26 times in the second quarter. The CIER index of the Internet and e-commerce sector remained in the first place, but fell from 9.21 in the previous quarter to 9.06 in the current quarter. The employment situation on the real estate/construction/building materials/engineering industry improved during this quarter, with the CIER index increasing from 2.78 in the previous quarter to 3.83 in this quarter. The CIER Index of Printing/Packaging/Paper/Petroleum/Petrochemical/Chemical/Environmental Protection Industries still remained low, while the traditional industries, represented by the manufacturing industries, had encountered many challenges and pressures. For occupations, the CIER Index is relatively high forthe skilled workers/operators and transport services. However, with the low barriers to entry, the employment situations on the public relation/media/environmental science/environmental protection/IT management/project coordination and other management occupations are relatively poor. For regions, the CIER index showed a decreasing trend in the eastern, central, western and northeastern regions, and the employment situation in northeastern China has improved, with the CIER index increasing from 1.17 in the previous quarter to 1.33 in this quarter. For the tier of cities, the second quarter of 2017 CIER indexshowed an increasing trend in the first, new first, second and third tier cities. For the size of enterprises, the CIER index of large and micro enterprises is high, and the employment situation of the small and medium-sized enterprises is relatively stable. For the nature of enterprises, with the deepening reform of the state-owned enterprises, its employment situation has improved significantly. Moreover, the employment situation of the joint, private and joint-stock enterprises is relatively positive. However, by the effect of foreign capital divestment and other factors, the employment situation of foreign-owned enterprises is relatively negative. Based on the above analysis, Report predicted that the CIER index for the second half of 2017 would continue to rise due to seasonal factors. The overall judgments and conclusions are : it will appear a big probability of stabilization and we will hold the view of cautious optimism. General manager Zhang Xiaoguang delivered a speech entitled "Report on Human Resources Situation in Suzhou Industrial Park in the Second Quarter of 2017”. This report analyzed the human resources index and market data of Suzhou Industrial Park, and it introduced the characteristics of the park's human resources market and the employment situation of the graduates and forecasted the human resources of the park in the third quarter of 2017. In the third quarter of 2017, it estimated that the demand for labor will be relatively strong. 26.3% of the enterprises will expect an increase in the demand for labor. Only 15.2% of the enterprises will expect to reduce the demand for labor. In addition, in 2017, enterprises will be expected to increase the overall recruitment plan over the same period, particularlyin the manufacturing and service enterprises. Dr. Li Xiaoman, delivered a speech entitled “Affected Workers in Resolving Overcapacity: Scales, Current Status and Resettlement Countermeasures”. This report mainly introduced the background of resolving overcapacity, the scale of the affected workers and the current situations, and it pointed out the problems and countermeasures in the resettlement of the employees. In the context of weak economic growth and the general overcapacity of traditional manufacturing capacity, the contradiction between supply and demand is gradually highlighted, and the reduction in output leads to a large decline in jobs. By combining both the input-output method and the enterprise micro-data, this study calculates the size of the affected workers in resolvingovercapacity. The affected jobs are in the order of steel, cement, ship, electrolytic aluminum, flat glass and steel industry in the core of industrial industry, so the total number of affected workers is the largest, and the job placement task is the most arduous. This study found that the main problems in the staff resettlement can be summarized as three "deficiencies", which included the lackness of developing the professional ability of affected workers, the lackness of protecting workers' rights and interests, and the lackness of playing a role in stabilizing employment. Then, she proposed some countermeasures and suggestions for the resettlement of the affected workers, such as resolving the current problems and eliminating the root causes,making the focal points stand out, making the classifiedpolicies, broadening the employment resettlement channels, establishing the targeted vocational skills training and the multiple participation mechanisms, and developing the role of "stabilizers" in unemployment insurance. During the keynote speech and the discussion section, the leaders and experts conducted the extensive and in-depth discussions on the second quarter employment situations and the future development trends. Peng Yongtao, deputy director of Population and Employment Statistics Department, National Bureau of Statistics, andGuo Cheng, division chief of Employment Promotion Department, National Ministry of Human Resources and Social Security, commented and analyzed those above reports on the basis of relevant works. Based on the data from Zhilian Zhaopin, Li Qiang, marketing director of Zhilian Zhao Pin, shared some new findings and reached the following conclusions. First, CIER index is positive, and the competition index of workers in the job market has continued to fall, but the regional competition index in Shenyang and Dalian is still high, indicating the difficulties in job searchingare increasing. Second, the average compensation has declined in the nationwide, especially in the small and micro enterprises, and those enterprises become more rational in employment and no longer hire employees at any price. Third, some talents from the first-tier cities begin to come back to the new line and second-tier cities. Finally, unlike the trends in the previous years, the activity of college students on job searching is still high currently, indicating that job-finding of college students is still difficult. Wu Xingyan, general manager assistant of Suzhou Industrial Park, mainly introduced the development of Human Resources in Suzhou Industrial Park. Suzhou Industrial Park is still a population input area and has a strong ability to attract the talents. At present, the proportion of the talents in the park, that is, the proportion of the junior college degree or above, has risen to 45%. The transformation and upgrading of the talents reflects those of the industries. And now the park is gradually phasing out labor-intensive enterprises, while actively introducing technology-intensive, capital-intensive and environmentally friendly energy companies. In addition, the high-end service industry, shared center and large data, cloud computing, software companies become more welcome in the park. However, facing recruitment difficulties, some enterprises seek help from labor dispatching company or other intermediaries to find the right staffs, which to some extent increased the costs of labor employment. Therefore, in the process of industrial transformation and upgrading, staff training needs to be strengthened so that the labor surplus can be truly turned into the employees needed by the enterprises. Hao Jianbin, employment research director of Alibaba Group, shared the view of new economic and employment form. According to his comments, the current economy is faced with an incremental and a stock. The stock is the traditional industrial economy, while the incremental refers to the new economy represented by consumption and service, and the increase in jobs created by the new economy is greater than the replacement where it appears. Perspective from the overall economy, in the transition from the original production-driven economy to the consumer-driven or service-driven economy, many enterprises, universities and government lack of transition capability, and the data training is backward, resulting in a large number of mismatches in skills, consumption structures and employment structures. In addition, in the data economy, it is not appropriate to use the industrial standard to measure the amount or the mode of current employment. In particular, the generation after the 90’s and after 00’s, in the case of certain material accumulation, they can choose to start their own business，or they can choose slow employment or non-employment. They can no longer be similar to the past, which facing the urgent need to find a job because the food and clothing problems. Finally, from the perspective of women's entrepreneurship, China is ahead of the rest of the world. According to the statistics of 145 women-based entrepreneurial enterprises, women in the consumer electronics business, including education, life, service, health care and health, account for a higher proportion of entrepreneurship, and in the field of “Shuang Chuang”, women also have a great contribution. Zhao Jing, data analyst of 58.com, presented the employment data analysis results of 58.com. From the overall job seekers supply point of view, compared with the same period of last year, the number of job seekers has increased, and the overall labor supply and demand ratio are the same as last year. For the employment of graduates, the current graduates mainly born after 1995s, and they have two important characteristics in respect of the employment choice. First, in the regional choice aspect, they are more inclined to the new first-tier cities. Second, they are more inclined to choose small-scale enterprises(one hundred people below). Associate professor Liu Erduo, researcher of CIER, associate professor of School of Labor and Human Resources, Renmin University of China, expressed some ideas on the future employment research. The current economic situation and employment situation improved mainly from two aspects: the first is the cyclical recovery, and the second is the impact of long-term trends. It is worth studying the long-term trend of the overall labor supply. From the historical experience of the development of other developing countries, China's labor market and the job market are maturing, and the problems of slow employment and non-employment are the mature performances of the labor market. He also mentioned we need to pay attention to the cyclic statistical problemsof the employment data,since it will lead to the decline in data accuracy, which should be avoided in the study process. Associate professor Guo Yu, chair of Social Security Department of School of Labor and Human Resources, analyzed the relationship between labor employment and social security. Social security was initially designed to ensure employment and maintain a harmonious relationship between capital and labor. As social security is developing to a very mature and stable system, it also has certain rules, and it formed a mutual symbiosis relationship with the labor employment. She further said, in the future the labor employment research can collect more relevant data so as to explore the relationship between them. Li Hongjian, professor at China Institute of Industrial Relations, shared some research findings with respect to overcapacity enterprises. On the one hand, the problem of employment in overcapacity industries in northeastern China is affected not onlyby the recent policy, but also by the previous round of state-owned enterprises reform on positions. On the other hand, as for the issues of subsidies on workers in overcapacity industries, the inadequate local financial subsidies limited the functions of supporting subsidies of central finance. Li Zhilong, deputy division chief of Population and Employment Statistics Department, National Bureau of Statistics, pointed out some new ideas and opinions on the employment situation of women and college students. In his views, the rise in the women unemployment rate has something to do with the changes in the industry. In genera, the new economy is friendly to females, and women’s employment situation is better. However, due to the shrink of some traditional industries where women accounted for a large proportion, women in those industries has an increasing employment rate. In addition, the unemployment rate of college students has also increased recently. After controlling for the marital factors, it is found that the unemployment rate of unmarried college students is higher than that of married college students, showing that marriage, to some extent, may stabilizethe individual employment. Finally, Professor Zeng Xiangquan gave a summary of the seminar. Firstly, we need to make an objective judgment on the employment situation. A notable problem isthat we need to explore issues on development and employment in the future researches from the angle of history. But there is still a large gap between China and other developing countries or regions, mainly in the measurement means of employment and unemployment, which are relatively backward. The main problem is that employment and unemployment statistics and data collection need to be improved. Although China Institution of Employment Research, cooperated with Zhilian Zhaopin, Suzhou Industrial Park and some other institutions, has developed CIER index, demand matching index, and other big data index, we still need to further study and learn from the experiences and practices of employment and unemployment statistics and measurement in developed countries or regions. Secondly, we should pay attention to the new features of college students‘employment under the new situation. With the reform and development of the economic situation and the social environment, college students’ employment situation has been constantly changing, and appeared some new situation such as "slow employment", "being employed" and "mismatch", etc. Thirdly, we should focus on the employment of long-term unemployed and low-income people, especially the non-standard employment situation in China. According to the analysis of existing big data, it shows that the correlation between the part-time job market and the overall employment market is negative. When the overall employment market situation is poor, the employment situation in part-time job market will be improved. In addition, what is the the relationship between the non-standard employment and the standard employment, is it complementary or alternative? Are the new technological revolutions and the artificial intelligence a gospel or a disaster for human employment? These questions are still needed to be explored and researched.